By the second half of winter I'm getting pretty impatient with a serious case of garden withdrawal syndrome. The days may be short but you can just about perceive them drawing out once again. Still, in my part of the world it's often late winter that brings the coldest weather, shocking the land with hard frosts or a blanket of the white stuff. Yet no matter what's thrown at us you know that the growing season is just a few weeks away. Soon the gentle warmth of early spring will pierce the cold and the first seeds of the year will be sown – a joyous moment indeed! Part of my strategy to speed things along is to provide a small armory of protection against the cold. Cloches of all types, including row cover tunnels and home-made bottle alternatives all have their part to play in defying the seasons and stealing a march on the growing season. The word cloche comes from the French for 'bell', reflecting its traditional shape. 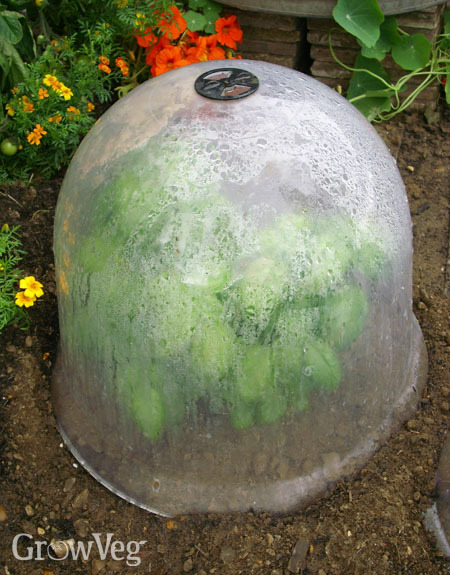 An original glass cloche is a thing of great beauty and was commonly used in Victorian kitchen gardens to force crops or ensure a cosseted environment for early sowings. Today cloches are available in many shapes and sizes as well as materials including plastic or corrugated polycarbonate. I aim to set my cloches into position about two to three weeks before the first intended sowing. This has two outcomes: as well as warming the soil it helps to dry it out a little, which after a wet winter is essential to stop seeds rotting rather than germinating. Seeds need a friable, crumb-like soil consistency that's moist but never saturated. By physically blocking precipitation and gently warming the soil cloches achieve this in efficient time, potentially gaining a whole month's head start on seeds sown without protection. Cloches laid for early sowings need to be sturdy enough to stand up to the wind. Those made of lighter material such as plastic run the risk of being lifted up by gusts, so make sure they are properly secured by either burying the sides into the soil or weighing the structure down. These types of cloches have a rectangular footprint, making them just the ticket for fitting over rows of seedlings. They are also easy to extend – simply add another onto the end of the row and re-secure the end plate. Row tunnels offer a golden opportunity to cut costs on the vegetable plot by making your own. This isn't difficult (even I can manage it and I'm certainly no home improvement enthusiast!). The hoops of the tunnel can be made using alkathene/polypipe about 15mm (0.5in) thick and cut to size. Make sure each hoop is the same length and suitably long enough to accommodate the width of your beds and the height of the crops to be grown within them. You don't want the leaves of tender crops to touch the cover on a frosty night, so aim for a hoop height of at least 60cm (2ft) to 90cm (3ft). Anchor the hoops into position by pushing them onto pegs made of rebar or a similar solid material hammered into the ground. The hoops will be more rigid if they are drilled at the ridge to a joining batten running the length of your new tunnel. The hoops can be left up year-round or pulled free of their pegs for storing. The best cover for a homemade tunnel is polythene tunnel plastic. This tough plastic will last longer and is less likely to tear as a result of UV degradation. Alternatively use floating row covers of garden fleece, though bear in mind this won't help the soil to dry out after a wet winter. It will, however, serve as a handy insect-proof cover once the growing season's under way. Covers need to be thoroughly secured against wind. One loose flap is all that's needed for the wind to get in and your cover to be lifted clear and carried away! Drape the cover over the hoops and bury the edges or weigh them down with bricks or stones. A user-friendly option is to staple the edges of your cover to battens that can then be rolled up as necessary to inspect your plants or ventilate the tunnel on a warm day. Weigh down the cover material at both ends of the tunnel or tie in a scrunch with strong string that's then pinned down like a tent guy rope. In the windiest locations you may need to physically clip the cover to each hoop, using two to three clips per hoop. Cloches for protecting recently planted out tomatoes or helping just small clusters of seedlings on clear the way for creative recycling. 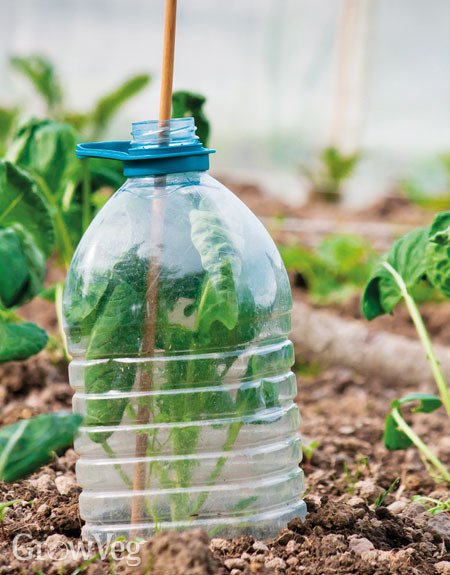 Plastic drinks bottles make for ideal plant-sized protection, offering a buffer against wind and light frosts – simply cut off the base and pop over your plant. Clear bottles work best because they allow maximum light transmission; don't forget to peel off the label either. The very best bottle cloches are those made from gallon-sized mineral or drinking water bottles. Keep them from blowing away by securing them through the neck of the bottle with a cane. If you're using our Garden Planner, cloches, row covers and other season-extending garden structures can be added to your plan where you will be using them. When one of these season extenders is placed over a plant on your plan, the Garden Planner automatically adjusts the dates recommended for sowing, planting and harvesting that plant to take into account the protection offered by the structure. Plants grown under cover will be marked separately on the Plant List and in the planting reminders sent by email. With suitable protection in place there's no reason why spring shouldn't be sprung up to a whole month earlier than it might otherwise be. What a warming prospect that is for the frustrated kitchen gardener! "Gracias por la in formación tan valiosa "
"Plastic bottle cloches- I've been using them for ages without knowing they had a name! I use big 5Lt bottles to protect small veges from the elements and especially hungry snails."